Sierra Leone’s Vice President, Ambassador Victor Bockarie Foh on Friday, 12 June, said that the Government of President Ernest Bai Koroma gives great prominence to the issue of women empowerment and gender equality, as could be seen in Pillar 8 of the country’s development plan – the Agenda for Prosperity (AFP). He spoke in Makeni, whilst deputizing President Koroma, during the official launch of the Women Empowered for Leadership and Development (WELD) Project at the Wusum Hotel. According to Vice President Foh, the government had invested considerable expertise, efforts and resources into the Agenda for Prosperity, and considerable gains, he said, were made in the country, prior to the outbreak of the Ebola virus disease. Despite the outbreak of the Ebola Virus Disease in the country, Vice President Foh said, that the government is committed to meeting the development goals outlined in the AFP, especially in creating an admirable Sierra Leone. “It has not impeded our resolve to move forward and take the country to another level”, he assured. 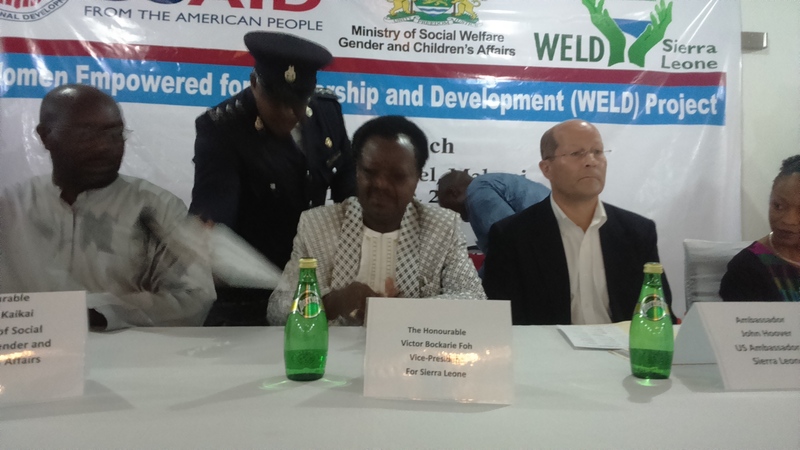 Speaking about the WELD Project, Ambassador Foh said that the overall project goal is to increase women’s social, economic and political participation in the governance realm and “support women’s leadership development by building the capacity of local councils and sub-national entities to plan, manage and deliver appropriate gender sensitive programmes and policies for effective service delivery”. The Vice President thanked the country’s development partners, especially the United States of America, who discussed a Memorandum of Understanding in 2013 with the government of Sierra Leone, which among other matters, support the promotion of gender equality, the empowerment of women. He said that in 2014, the US government through the USAID, approved a $3.9m three-year grant aided the World Vision International in support of the country’s Agenda for Prosperity. This grant, he said, was specifically meant for the WELD Project. The Minister of Social Welfare, Gender and Children’s Affairs – Alhaji Moijue Kaikai thanked President Koroma for promoting women and children’s issues. The launch of the WELD Project, he said was in line with government’s commitment to ensuring women empowerment and gender equality in accordance with Pillar 8 of the AFP. Minister Kaikai disclosed that the WELD Project will also benefit Ebola survivors across the country, assuring that his ministry will play a monitoring and evaluation role in ensuring the full implementation of the Project. He called on stakeholders, especially civil society groups to be monitors of the Project for its full implementation. The US Ambassador to Sierra Leone, John Hoover pledged the US government’s continued support for Sierra Leone’s development. When women are safe and empowered, he said, society benefits. 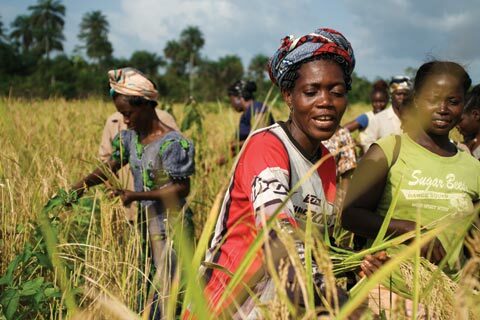 The objectives of the WELD Project are to ensure that women’s empowerment and representation in decision-making processes is increased; promote gender sensitive planning, monitoring and reporting adopted at council, community and national level; and increase the critical mass of organizations to influence gender policies at the national level. The Project will be implemented through a consortium of national and international humanitarian organizations, led by World Vision International. Other consortium partners include Action Aid, Network Movement for Justice and Development, and Advocacy Movement Network.